The Iranian general did not offer to build the Palestinians a hospital or a school. Nor did he offer to provide financial aid to create projects that would give jobs to unemployed Palestinians in the Gaza Strip. His message to the Palestinians in the Gaza Strip: Iran will give you as much money and weapons as you need as long as you are committed to the jihad (holy war) against Israel and the “big Satan,” the US. The same Hamas that is telling UN representatives that it wants to improve the living conditions of Palestinians in the Gaza Strip is the one that is reaching out its hand to Iran to receive funds and weapons. Now, someone needs to step in and stop Iran from setting foot in the Gaza Strip and using the Palestinians as cannon fodder in Tehran’s campaign against the US and Israel. How might someone do that? It is not so complicated. Any international aid to the Gaza Strip must be conditioned on ending Iran’s destructive effort to recruit Palestinians groups as its soldiers. It is that simple. While the United Nations, Israel and the US are proposing plans to alleviate the suffering of the Palestinians in the Hamas-ruled Gaza Strip, Iran is pledging to continue its financial and military aid to Palestinian terror groups. Iran’s meddling in the internal affairs of the Palestinians is not new. The Iranians have long been providing Hamas and the Palestinian Islamic Jihad terror groups with money and weapons. Were it not for Iran’s support, the two groups, which do not recognize Israel’s right to exist, would not have been able to remain in power in the coastal enclave. Iran’s support for the Palestinian terror groups has a twofold goal: first, to undermine the Palestinian Authority, which is headed by Mahmoud Abbas, and which Tehran sees as a pawn in the hands of the US and Israel; and second, to advance Iran’s goal of destroying Israel. Just this week, we received yet another reminder of Iran’s true goal. The leader of Iran’s “Islamic Revolution,” Ayatollah Ali Khamenei, said that the Palestinians will win over their enemies and will “see the day when the fake Zionist regime” vanishes. He said that US President Donald Trump’s “evil policy” is doomed to failure. So, Iran does not care about the harsh conditions of the Palestinians in the Gaza Strip. Instead, its leaders are hoping that the Palestinians will live to see the day Israel is eliminated. This is also why Iran continues to support any Palestinian group that seeks to destroy Israel. On the same day that Khamenei made his statement in Tehran, one of his senior generals, Gholamhossein Gheybparvar addressed a conference held in the Gaza Strip and Tehran simultaneously. 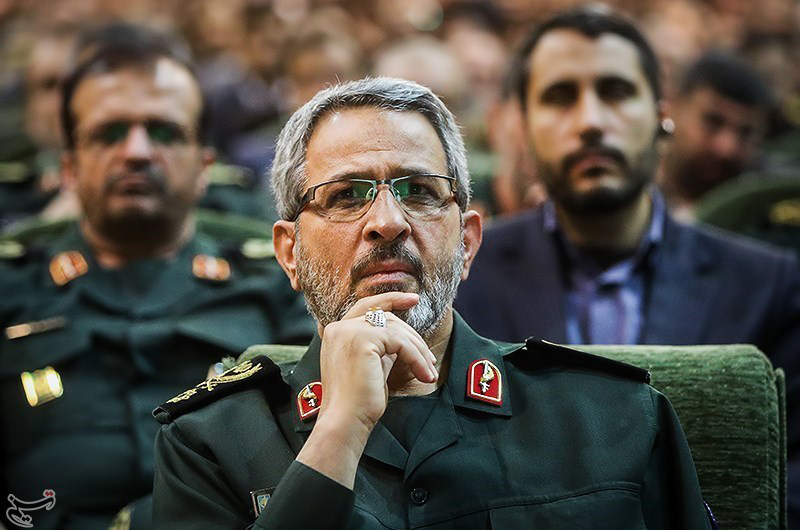 Gheybparavar is a senior officer in Iran’s Revolutionary Guards and commander of its Basij forces — the “Mobilization Resistance Force.” This force’s main mission is to suppress protests against the regime in Tehran. The Palestinian terror groups said after the conference that they were encouraged by the Iranian general’s pledge to support them in their fight against Israel and the US. Khader Habib, a senior Palestinian Islamic Jihad official in the Gaza Strip, said that the Iranian-Palestinian conference was both “symbolic and significant.” The conference, he said, served as a reminder that Iran continues to support the Palestinian “resistance” and would deter Israel from attacking the Gaza Strip in response to terror attacks on its citizens. The speech by the Iranian general, he added, was aimed at sending a message to the many countries to support the Palestinian “resistance” groups in the Gaza Strip. “Israel is a potential threat to the Arabs and Muslims,” Habib said. Buoyed by the Iranian backing, several speakers at the conference called for the formation of a “unified Arab-Islamic front” against Israel and the US. They also stressed that the terror attacks against Israel would continue and praised Iran for its full support for the Palestinian factions in the Gaza Strip. By promising to continue helping the Palestinian terror groups, Iran is offering the two million residents of the Gaza Strip more bloodshed and violence. The Iranian general did not offer to build the Palestinians a hospital or a school. Nor did he offer to provide financial aid to create projects that would give jobs to unemployed Palestinians in the Gaza Strip. His message to the Palestinians in the Gaza Strip: Iran will give you as much money and weapons as you need, as long as you are committed to the jihad (holy war) against Israel and the “big Satan,” the US. The Iranian message to the Palestinian terror groups came at a time when several international parties are trying to resolve the “humanitarian and economic” crisis in the Gaza Strip. These efforts are spearheaded by the UN’s Special Coordinator for the Middle East Peace Process, Nickolay Mladenov, who in recent weeks has been on a mission to prevent another war in the Gaza Strip. Meanwhile, it appears that Hamas wants to have it both ways. On the one hand, Hamas wants the international community to step in and help the people of the Gaza Strip. On the other hand, Hamas wants Iran to continue funding its terrorism. The same Hamas that is telling UN representatives that it wants to improve the living conditions of Palestinians in the Gaza Strip is the one that is reaching out its hand to Iran to receive funds and weapons. We can take a tip from Abbas’s and Fatah’s anxiety: If they are worried about Iran’s ongoing efforts to infiltrate the Palestinian arena, the US and the rest of the world need to find ways to stop Iran from using the Palestinians as a weapon in its battle to extend its control over more and more countries in the Middle East and carry out its deadly schemes. Iran has brought nothing but disaster to Iraq, Yemen, Lebanon and Syria. Now, someone needs to step in and stop Iran from setting foot in the Gaza Strip and using the Palestinians as cannon fodder in Tehran’s campaign against the US and Israel. How might someone do that? It is not so complicated. Any international aid to the Gaza Strip must be conditioned on ending Iran’s destructive effort to recruit Palestinians groups as its soldiers. It is that simple. This entry was posted on July 19, 2018 at 3:37 PM and is filed under Iran - civil unrest, Iran - world's worst sponsor of terrorism, Iran / Israel War, Iran and Assad, Iran and Europe, Iran and Hamas, Iran and Hezbollah, Iran and Houthi, Iran and Israel, Iran and Jews, Iran and Middle East, Iran and Palestinians. You can subscribe via RSS 2.0 feed to this post's comments.